There was a lot of fanfare surrounding the launch of OnePlus 2, with OnePlus following the same pattern of planned leaks and teasers it used with the original. 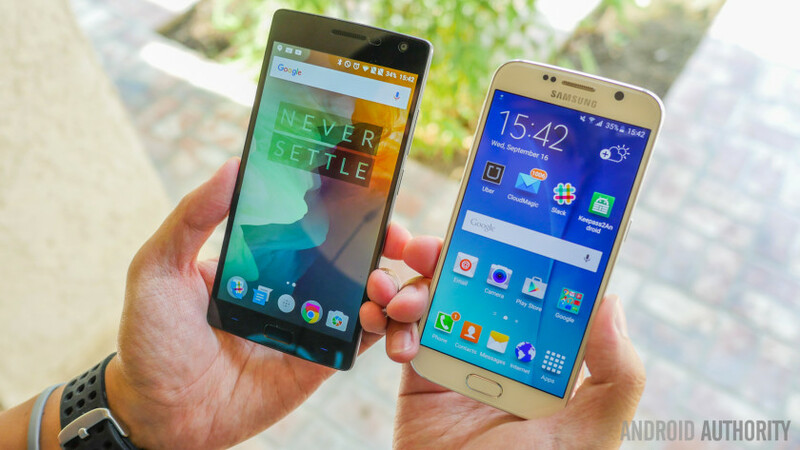 The OnePlus 2 does get a lot right, but it’s not without its flaws, which raises the question: does it stand up to its moniker of “flagship killer?” To find out, there’s no better device to pit the OnePlus 2 against than the latest Samsung S series flagship, which has a seen a major overhaul in design, build quality, processing power, and software. 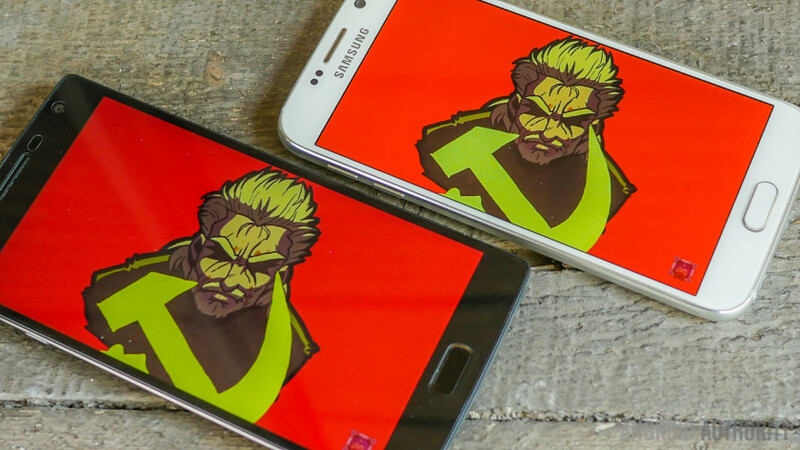 How does the latest OnePlus fare against one of Samsung’s finest phones to date? 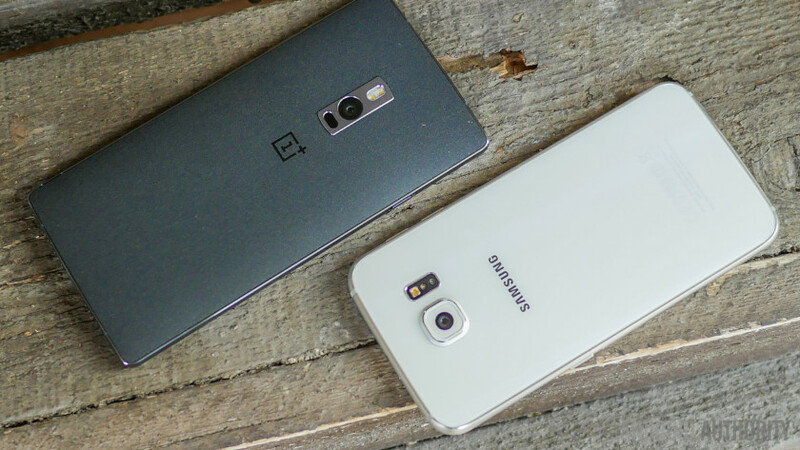 Here is a comprehensive look at the OnePlus 2 vs Samsung Galaxy S6! Design is certainly a big button topic for both of these devices, as Samsung and OnePlus instituted some real changes to their existing formulas. Of course, the change is especially dramatic on the Galaxy S6, the latest in a line of high profile devices. Despite changes in build materials, the Galaxy S6 is still a Samsung device in shape and layout, which includes the fingerprint reader embedded in the physical home button. There are no real surprises to be found here, until the choice of build material comes into play. The metal frame and dual glass panel construction made this this first Galaxy S device to move from plastic. On the downside, as a result, the Galaxy S6 no longer sports a removable back cover. Many users considered this a step backwards, as features like a removable battery and expandable storage have been removed as a result, but the Galaxy S6 is definitely the most premium and the sleekest Galaxy S flagships we’ve seen. The 5.1-inch screen keeps the phone from feeling too small or too big, which is a boon for those who demand a good handling experience. The glass construction does make this device extremely prone to fingerprints, but nevertheless, the Galaxy S6 was the beginning of what turned out to be Samsung’s year of good design. The OnePlus 2 has also seen some changes when compared to the original, mainly in the addition of a metallic frame of its own. The metal does a good job of making this phone feel quite premium, and the stock sandstone black material of the back cover helps differentiate this phone from basically every other device that is currently available in the market. Despite retaining a 5.5-inch display from its predecessor, the OnePlus 2 has a slightly smaller footprint, which does help in the handling experience, even if the device still continues to toe the line of comfort. The buttons and design elements around the device deserve a mention here, especially the new Alert Slider found on the left side, which works as a notification toggle, and basically offers a very easy way to silence your phone. The home button is recessed now and flanked by back and recent apps keys, though the real story is in the fingerprint reader incorporated in the home button. The touch based sensor makes it super simple to unlock the device, even when the screen is off. Finally, on the bottom is where you will see the adoption of the new USB Type-C standard for the charging port, and it’s a change that might take some getting used to. The new port means that all the microUSB cables you may have lying around are no longer useful, and more importantly, having the the new cable on hand is something that you will always have to keep in mind. As always, making a choice between two designs is purely a matter of opinion, but both of these phones have been changed for the better, compared to the previous generations, thanks to the usage of premium materials. The Galaxy S6, despite feeling very different in the hand, is quintessentially still a Samsung flagship. The metal and glass unibody design may have caused the removal of a couple of key features, but the result is one of the most attractive (albeit a little delicate) Android devices currently available. The OnePlus 2 also lacks expandable storage and a replaceable battery, but its back cover can be swapped with alternative covers of different materials and designs. What was once mostly plastic in both of these companies’ pedigrees has now been upgraded. The larger screen of the OnePlus 2 does make it a little harder to handle, but that is a small factor in what might be a pretty tough decision, because both of these phones look pretty great. The Samsung Galaxy S6 sports a 5.1-inch Super AMOLED display, with a Quad HD resolution, resulting in a pixel density of 577 ppi. The Super AMOLED technology allows for incredible colors, and makes everything from text to videos to games look great. The Quad HD resolution and impressive pixel density on this medium-sized screen result in performance and quality that are on par or above every other device out there. It’s true that the Galaxy S6 Edge brings curved sides to the phone, but aside from being aesthetically pleasing, and somewhat helping with the handling experience, their addition don’t add a whole lot to what is already a fantastic display experience. On the other hand is the 5.5-inch LTPS LCD display of the OnePlus 2, which retains the 1080p resolution of the original, likely in an effort to keep the price of the device at a reasonable point. People may not have been pleased with this choice made by OnePlus, but that doesn’t mean that this display isn’t a great performer though. A bit more color and brightness has been added in for an even more enjoyable experience. Typical users will not be able to tell the difference with Full HD and Quad HD, so there is little reason to believe that the OnePlus 2 is really far behind the Galaxy S6 in the display department. Unless you are really spec-hungry, the Galaxy S6 only trumps the OnePlus 2 in color saturation. For many users, higher saturation is more enjoyable, and Samsung definitely has that aspect locked down. We give the OnePlus 2 marks for offering a really good display experience, but Quad HD is the flagship-worthy box this device can’t tick off. Performance is really of no issue with either of these smartphones, with the current best of Qualcomm’s Snapdragon series going up against a very powerful Samsung-made SoC. The octa-core Qualcomm Snapdragon 810 processor powers the OnePlus 2, clocked at 1.8 GHz, and backed by the Adreno 430 GPU and 4 GB of RAM. There is no doubt that sheer power is available with this processing package, and the Oxygen OS is what is mostly to blame for any of the little bugs and stutters that we’ve seen thus far. Games don’t have any trouble running, and the same is true for pretty much any other task as well. Moving between the various apps using the Recent Apps screen is as much of a breeze as expected. On the other hand, Samsung is putting their faith in its in-house processing package to bring the level of performance that users demand, and the octa-core Exynos 7420 undeniably gets the job done. With 3 GB of RAM on-board, multi-tasking is not hard at all, even with features like S Window and Multi-Window requiring more than what is necessary when just moving in and out of the Recent Apps screen. Also helping with performance is a toned down TouchWiz software suite, and it isn’t hard to see just how fast this phone can go when all of the questionable Samsung features are removed or, at least, well hidden. Performance is one aspect in which the OnePlus 2 manages to stand toe to toe with other flagships, and the device manages to keep up with the powerful Galaxy S6 as well. Oxygen OS still needs a few bug fixes here and there, however, but once optimized, we have no doubt that the day-to-day experience of the OnePlus 2 will be as a sublime as it is with the Samsung Galaxy S6 now. When you call your device a “flagship killer,” you must provide the same overall features as the competition, and the OnePlus 2 has a lot of extras to offer when it comes to the hardware side of things. It starts with the fingerprint reader that is embedded underneath the recessed home button, which works quite well. We did have some troubles with pressing the home button and getting the fingerprint to register properly, but these issues occurred only occasionally. The second big addition is the Alert Slider, which basically does what it sets out to, making it very easy to switch between the different notification modes introduced with Android Lollipop, including All, Priority, and None. If you aren’t already the kind of person that keeps their phone on silent all the time, the Alert Slider will prove extremely useful. It’s just so easy to locate the switch and toggle it without looking at it, so you won’t even have to take it out of the pocket if you don’t want to. The OnePlus 2 also supports two SIMs; this feature may not be considered a necessary addition by users in the West, but even they could make use of the OnePlus 2’s dual SIM support when travelling abroad. The USB Type-C port on the OnePlus 2 is nice, but due to the adoption of this new standard, the phone doesn’t have any fast-charging capabilities. That’s despite the fact that Snapdragon 810 typically supports Quick Charging 2.0. The OnePlus 2 also lacks wireless charging support, so you better keep that nice red charging cable in a safe place. That said, the 3,300 mAh battery does allow for some fantastic battery life, providing as much as 5 hours of screen-on time in a typical day, which somewhat alleviates concerns related to the lack of fast charging. The Galaxy S6 brings its own suite of extra hardware features, and while some of them are returning from previous generations, albeit in better implementations, there are some new add-ons as well, starting with the built-in wireless charging. The Galaxy S6 supports wireless charging out of the box, as well as fast charging, allowing for a full recharge in just about an hour. That is a capability you may unfortunately have to rely on however, as the 2,550 mAh capacity of the battery doesn’t let you power through a full day of full usage. NFC isn’t usually a feature that we talk about, but it’s important to note in the case of the Galaxy S6, with the imminent arrival of Samsung Pay. It’s even more important to mention in connection with the OnePlus 2, which surprisingly lacks NFC. OnePlus claims OnePlus One users simply don’t care about NFC, but the decision to not include the connectivity method on the OnePlus 2 remains hugely controversial. As a result of the lack of NFC, OnePlus 2 will not be able to run Android Pay (and other payment systems), so anyone that is looking to adopt the future of payments will probably choose the Galaxy S6 here. Samsung’s own fingerprint reader is embedded in the tactile home button up front and it seems to be just as fast as the OnePlus implementation. The Galaxy S6 posed its own infrequent issues with registering a fingerprint, so these devices tied in our testing. Of course, Samsung tries to make their phones do everything, and returning with the Galaxy S6 is a heart rate sensor on the back of the phone, to be used with an updated version of S Heath. It is nice to be able to check your heart rate or even stress levels from time to time, though we certainly wouldn’t call this a complete health tool for anyone that is really serious about fitness. Bottom line, it’s heart rate monitoring vs silent-mode switch, fast charging vs larger battery capacity, and Dual SIM vs NFC. In hardware we have a toss up between these two devices, but we have to give OnePlus credit for closing the gap in this particular aspect. Given the current landscape in this category, the OnePlus 2 had one place to truly excel in order to be considered a real flagship killer, and that is the camera. At first glance, it isn’t off to a great start with the camera application, which is a modified version of the Google Camera, and misses a number of modes and manual controls that have become commonplace with this year’s high-end releases. Manual controls, and perhaps RAW capture mode, would be needed to make this a true companion for anyone serious about photography. Even then, the camera app isn’t the fastest we’ve seen, despite the addition of OIS and a laser auto focus system. Auto focus does see an improvement though, despite the OIS getting stifled by the camera app typically opting for slower shutter speeds, which negatively impacts the stabilization. We have been told that an update to the camera software will include manual controls and further optimizations, and honestly, those can’t come soon enough. When comparing the two camera applications, the Samsung Galaxy S6 benefits from a long pedigree of fully featured camera offerings. With optical image stabilization, this 16 MP shooter boasts not only manual controls, but plenty of other modes that can take advantage of a very good sensor. The manual mode adds a lot of control, even if it isn’t as granular as on other apps we’ve seen in the market. But by far, the best part of the Galaxy S6 camera is the speed of opening the app with a simple double tap of the home button. Picture quality is of course, what matters the most, and unfortunately, the OnePlus 2 delivers some good photos without really going beyond. For most pictures, when zoomed out, the pictures look great for a myriad of uses, like social media, but zoom in even a little bit, and the lack of detail can be observed. The Galaxy S6 manages to get a little more detail out of its pictures, though its coloration can be excessive for photography purists. The oversaturation is often met positively by anyone looking for extra punch in their photos, though. HDR is often up to interpretation by all companies, and in the OnePlus 2, we do see quite a bit more dynamic range, as dark areas are brightened, and vice versa. Though things aren’t as drastic in HDR mode with the Galaxy S6, it’s still more detailed than the OnePlus 2. In low light situations, the main issue is that the OnePlus 2 chooses really slow shutter speeds, over anything else, resulting in OIS being unable to do its job if the hands have to remain steady for longer than a fraction of a second. The already very grainy low light shots are not only blurred out, but more importantly, harder to capture. On the other hand, the Galaxy S6 can suffer from sub-par low light shots as well, but capturing these photos is definitely not as difficult as it is with the OnePlus 2. Though we would like to see someone surpass even Samsung in the smartphone camera department, the Galaxy S6 will definitely not be “killed” by the camera of the OnePlus 2. Finally, on the software side of things, we see a stripping down of user interfaces. Starting with Samsung, there was a renaissance of sorts, when much of what we called bloat in TouchWiz simply disappeared. Gone are a large amount of tutorials that would get in the way, and quite a few of the built-in extras can actually be disabled, such as the Briefing news homescreen. The end result is probably the most accessible version of Samsung’s software to date, and with Lollipop at the backend, what is on the surface can actually be themed and customized. The most useful features pertain to multitasking, like the Multiwindow feature, which brings the same abilities as before for anyone who is looking to do two things at once. The S Window is available by dragging down from the top corner, but TouchWiz certainly isn’t as pushy with forcing you to use it this time. Since the release of its first phone, OnePlus had a very public falling out with Cyanogen, leaving it to create its own software, called Oxygen OS. For most intents and purposes, Oxygen OS is a modified stock Android interface, with a few additions, which include the gestures for the turned off screen, and the ability to change up the capacitive keys for on-screen navigation keys. App permissions do come with this OS ahead of the Marshmallow release, and though they might not be used all the time, anyone interested in security will appreciate its availability. Finally, there is Shelf, which is Oxygen’s version of an extra homescreen, that houses a number of user defined widgets including frequently used apps and contacts. We love stock Android, and OnePlus has done a good job of leveraging it to Oxygen’s advantage, but TouchWiz has seen its own shift that brings tons of functionality in a toned down package. Oxygen OS does have some issues with certain bugs and hiccups, but they should be fixed with updates. 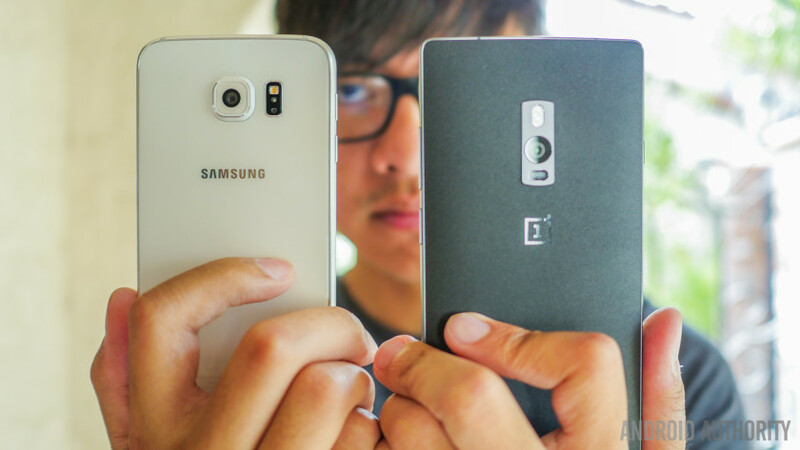 So there you have it for this in-depth look at the OnePlus 2 vs Samsung Galaxy S6! As far as being a flagship killer, the OnePlus 2 unfortunately does not live up to that name this year. While it is able to match the performance, and even the hardware packages, of many current flagship smartphones, it doesn’t do enough to surpass phones like the Galaxy S6. The lack of Quad HD is a small difference in hindsight, but the poor camera simply puts the OnePlus 2 behind, not to mention a few other features that the Samsung smartphone boasts, including fast charging, wireless charging, and the ability to take advantage of mobile payment services. Despite some forward thinking with the implementation of the new USB port standard and the inclusion of the Alert Slider, neither are killer features that really put the OnePlus 2 higher than the rest of the competition. In this comparison, the Galaxy S6 is simply better, as long as you can afford it. 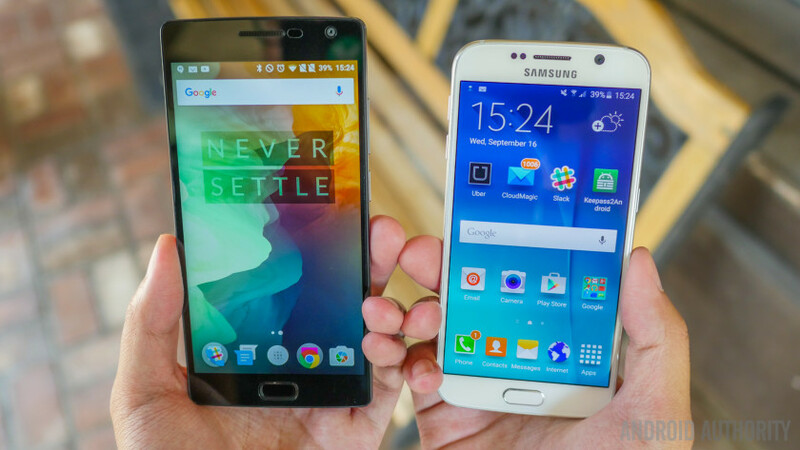 The price of the OnePlus 2 makes it a compelling choice, if the extras the Galaxy S6 offers aren’t necessary for you. That said, you get what you pay for, even if the OnePlus 2 offers a little more bang for your buck.